Vinegaroons, also known as whip scorpions, are arachnids related to spiders and scorpions. Unlike scorpions however, they do not have a stinger. Instead, they have a “tail” covered in sensory hairs, and a gland at the base of the “tail” from which they can squirt acetic acid. To a predator such as a lizard or coyote, vinegar in the eyes should come as quite a shock! Luckily, to humans, vingaroons are fairly harmless. They don’t bite, and can’t do very much with their claws. You’ve heard me talk about my pet vinegaroon, Stanley. He’s doing quite well, eating plenty of grasshoppers and plumping up. While I was in Arizona this august, I saw a whole bunch of his friends! The first one I found was a juvenile, its body hardly more than an inch long. Note the reddish claws and legs – they turn black once they grow bigger. And that first pair of really long legs – they actually use those like antennae! 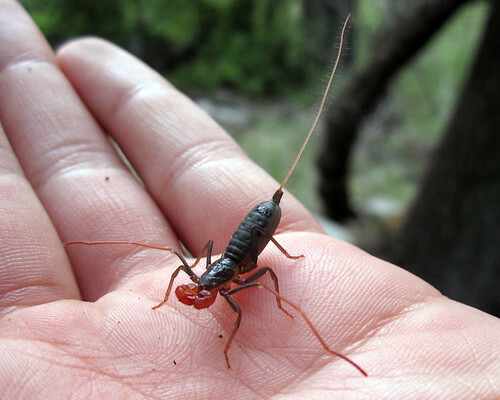 It’s funny to watch a vinegaroon explore the landscape by feeling all over with their antennae-like legs (their eyes are small and quite weak). Throughout the week I found about half a dozen more – some young, some old. Another student on the trip caught a large female who stayed with us as the lab mascot – Vanna the vinegaroon. We delighted in feeding her crickets and beetles until it was time for us to leave. For anyone who is looking for an interesting invertebrate pet, I’d recommend a vinegaroon in a heartbeat. They should not be handled unless necessary (such as to clean the cage, you’ll probably end up smelling like vinegar), but are fascinating to watch. They are creepy but harmless, and quite active compared to tarantulas and scorpions. They are often bred for the invertebrate pet trade, and sometimes appear in pet stores. If you have any questions about vinegaroons, let me know! Posted on September 3, 2011, in Invertebrates. Bookmark the permalink. 5 Comments. Haha, that was my impression too, except I was *excited* to visit a place with such awesome creatures all over. It takes a bit of work to find them! Especially with vinegaroons, since they only come out during the monsoon season. When one of those showed up around the pool I would find a grasshopper, stun it, and then toss it towards the vinegaroon. It was amazing how quickly they could find the grasshopper, even at > 3ft, and how fast they would move. I would also use a black light at night for finding scorpions and other spooky critters. Actually very creepy when so many critters appear under the light where it appeared there were none. Great fun!